(Bloomberg) -- As many of Europe’s biggest financial firms trim staff and brace for Brexit, their emerging competitors are charging ahead at full speed. Fintech, a broad category encompassing businesses from mobile banks to peer-to-peer lenders, hired aggressively in the first quarter in the U.K., Europe’s fintech hub, according to Ollie Sexton, a principal at recruitment consultancy Robert Walters. That follows a 61 percent increase in new fintech roles in 2018 that made it the fastest-growing part of London’s pre-Brexit economy, according to a report this week from Robert Walters and Vacancysoft, which provides data on recruitment. There’s still plenty of ground for the fintechs to cover. There were 76,500 jobs in U.K. fintech last year, with the the City of London projecting 105,500 by 2030. That’s against 1.1 million for the entire financial-services industry. Of course, financial firms of all sizes in the U.K. are confronting the Brexit squeeze. Fintechs are having to pay up to attract top hires to a country whose future remains in something close to limbo, increasing salaries by up to 8 percent for some specialties, said Sexton. Investors are content to make hay while the sun shines and continue to pour money into the sector. 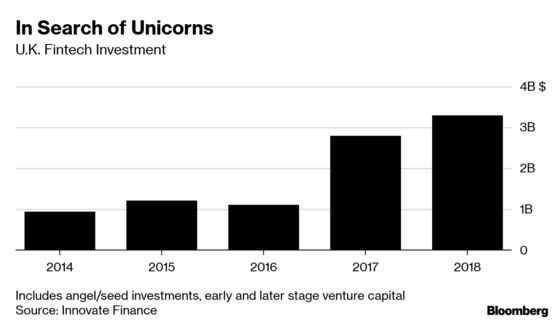 Investment in U.K. fintechs rose 18 percent last year to $3.3 billion, according to Innovate Finance, a London trade group.